Whether you are planning a new gym or gym expansion, it is important to remember that you will need to buy new climbing holds. Climbing holds and volumes are the tools routesetters use to create the product you are selling, so it is extremely important to budget enough money to buy quality tools so your setters can produce the highest quality products. What Holds Will I Need? With bigger gyms and lots of new climbers, it is important to plan for plenty of variety, including lots of large holds and volumes to help fill your wall space and set aesthetic routes and problems. Routes made of holds that “go together” are often easier for newer climbers to intuitively understand, so you’ll want to buy enough of each style (and more and more companies have large lines and complimentary styles) to set a few problems or routes of that style at the minimum. In addition, you’ll want many large holds because they look “fun” and make people want to use them. With the current trend of setting monchromatically, you’ll need plenty of holds of each color you are using so your setters can have enough holds of each color to choose from to set the routes and problems your gym needs. You’ll need holds of all types for all difficulties. You’ll need volumes to change up your walls. You’ll especially need a ton of jugs and feet. Obviously there are a lot of factors and many companies as well, so I’ll get into choosing your holds in later articles. How Much $$ Will I Need? At the moment several key consultants in the industry suggest budgeting $15-$17/square foot of wall space. There are many more complicated methods to figure out what exactly your budget should be, but if you want to have plenty of holds and you estimate $17/square foot, or even go higher to $20/square foot, you should be able to avoid the last minute rush on shelf stock that invariably happens when a new gym is trying to open with far fewer holds than they actually need. You’ll also get to choose your holds in advance instead of being stuck with whatever variety each company has on the shelf in your colors. So…$17/square foot, with 10k square feet of wall space = $170,000. $20/square foot would be $200,000. 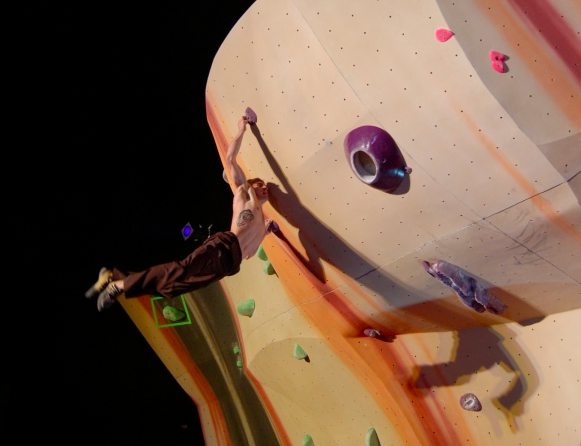 “Wall Space” in your calculations should include all climbing walls and training walls. Then tack on a little extra as training walls are often densly set, as are downclimbs. YES these numbers are reasonable. Heck, if it were my gym I’d want at least $250k for holds and volumes. The market is competitive and growing quickly, and part of that is getting new climbers interested and keeping them interested. We all have to put our best foot forward. But…my wall company gave me a hold credit in their proposal. Can’t I just use that? NO no wall company’s hold credit will provide you with all the holds you want and need. Budget a separate line item for holds you will order from many different companies, then let the credit from the wall company be the icing on the cake. It’s ok to budget high. More holds are only better for your facility. Having extra holds will give your setters more options so they can create better products. No setters will ever say you have purchased too many holds for them to do their job well. If you pick an arbitrary bottom line, for example, you target a cost of $X/hold, you will probably just shoot yourself in the foot. Holds come in all sizes and some holds cost more for a reason. It is not a high-margin industry. Some plastics are known to be stronger or last longer than other plastics. Do some research and you’ll find out that hold life expectancy varies by pouring house, and that spending a little more up front will pay off when your holds keep texture longer or just straight up don’t break. ROUTES AND PROBLEMS ARE YOUR PRODUCT. HOLDS ARE THE TOOLS THAT PRODUCT IS MADE UP OF. GET GOOD HOLDS. I cannot emphasize enough that you should not skimp on this budget item. The walls will cost X, and the holds will cost Y, and both of those things should be accounted for from the beginning.